Across the street from Vicki Harger’s childhood home in Golden Valley, MN was a nursing home. She dreamed of working there when she grew up. Despite a brain injury as a teen, Vicki completed schooling to become a CNA, eventually transitioning to office clerk and secretary positions. Later in life, a stroke put her in the hospital for six months, but she knew she still wanted to work. She still had a passion for helping others, but she needed help finding work. Now, Vicki works at His House thrift shop in Shorewood, where she sorts through donation bags. But how did she get there? Thanks to local programs, Vicki found the support she needed. 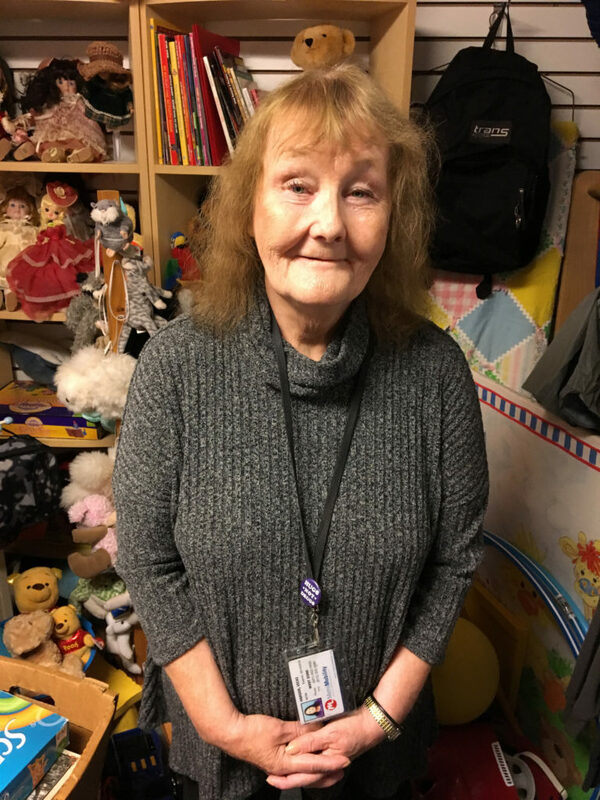 Vicki loves both the Adult Training and Habilitation Center (ATHC) program and Sojourn. ATHC found her the job at His House. When she suffered from another stroke earlier this year, ATHC held that job for her for over 180 days as she battled her way back to health. At Sojourn, Vicki found great social encouragement, from anxiety help to communication practice to new friendships. “Keep on keeping on,” Vicki says to others looking for work. “You have to have hope!” She has advice for employers looking for workers, too. The ATHC is a great tool for training future employees, and it is worth a look! Vicki is thrilled to be back at His House this October. She loves finding surprises in each bag, confessing that the baby clothes are her favorite. She enjoys donating to charities of her own. Above all, she is glad that she can give back to her community, where she can help people again.